It was unexpectedly chilly cold on Saturday, but we had a great turnout and were able to get a lot done in the garden. Many thanks to all who helped out on the various projects. Sorry if we fail to recognize anyone on a specific project–we’ll try to keep better track next time. 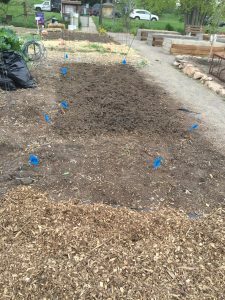 The blue corn plot was turned over and prepped for planting thanks to: Russell, Sissy, Charles R., Matt S. It looks great, and fingers crossed for a bountiful blue corn crop this season. Read about the Hopi Blue Corn Project here. Sorry, no photo, but imagine the smell from combining fish emulsion with the bokashi compost tea. We could smell it all over the garden! Thanks to Edward and Linda B. for tackling that task. The garlic will love it. The biggest job of the day was weeding the north fence line and exposing all of the perennials along it. It took a huge crew, but they got it done! Many thanks to: Charles R., Trishia P., Russell, Terry M., Scott M., Suzanne B., Sissy, Sarah, Priscilla. 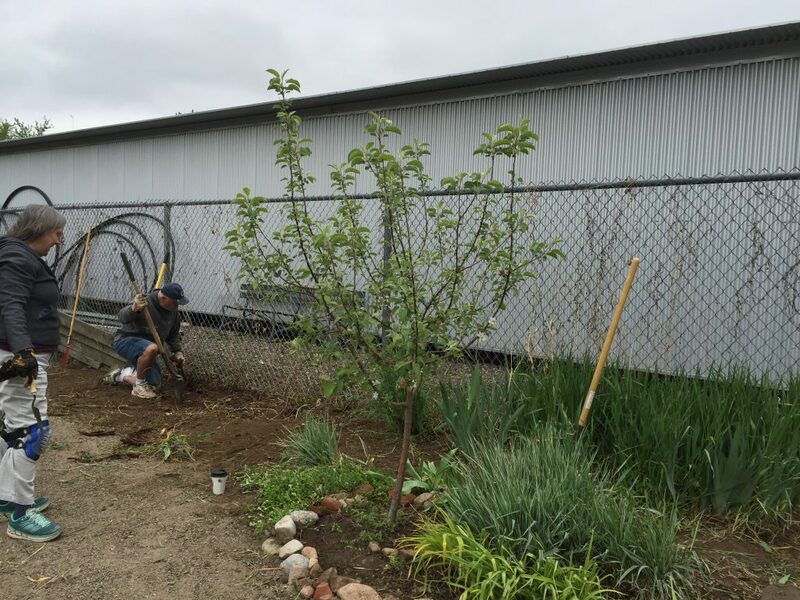 The next phase of this project, before the weeds have a chance to return, will be to lay black plastic or landscape fabric down and around the perennials, then cover with wood chips. If anyone has time to spend on it this week, the black plastic and/or landscape fabric and staples are in the tool shed. Send an “after” photo to plots@rosedalegarden.org so we can keep track of the progress. Thanks to Terry G. for all of the weeding by the front gate. Thanks to Charlie for loaning his mower to the garden for the day, and to Sarah for getting the grassy areas mowed. The garden looks great!